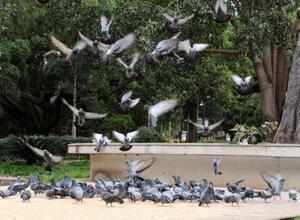 Patna, Nov 5 (IANS) More than five hundred pigeons suddenly dropped dead at a village in Bihar's Bhagalpur district over the last four days, causing residents, some of them pigeon-keepers, to fear that something was amiss. District officials are still to visit the site and conduct an inquiry. Over 500 pigeons died mysteriously in Bath village near Sultanganj in Bhagalpur, about 250 km from the state capital. "We were shocked, and we cannot understand why it happened," Subodh Kumar Singh, a keeper of pigeons who lost 250 birds in two days, said. Another pigeon keeper, Mohan Singh, said: "We need some manner of inquiry into this. Why did such a large number of pigeons drop dead in a matter of days?" Other pigeon keepers like Subhit Singh, Radhe Singh and Bhumeshwar Singh said the government ought to investigate the pigeon deaths. Alok Mankar, a veterinarian, said that the cause for the birds' death may have been technical problems in the radiation machine of mobile phone towers. He added, however, that he was only speculating, and that only an investigation could get to the root of the problem.